[PDF] Victoria's Wars: The Rise of Empire | Free eBooks Download - EBOOKEE! 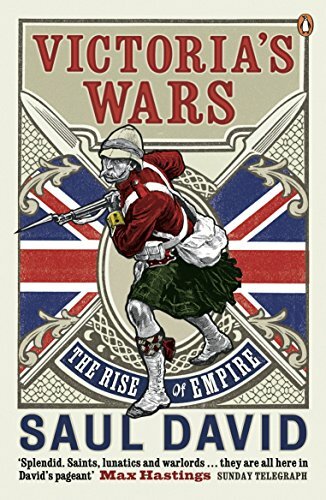 Description: In "Victoria's Wars: The Rise of Empire" Saul David explores the early part of Queen Victoria's reign, when the British Empire was well on the way to becoming the greatest empire the world had ever seen. This is the story of how it happened and the people who made it happen. In a fast-moving narrative ranging from London to the harsh terrain of India, Russia and the Far East, Saul David shows how Britain ruthlessly exploited her position as the world's only superpower to expand her empire. Yet little of this territorial acquisition was planned or sanctioned by the home government. Instead it was largely the work of the men on the ground, and to those at home it really did seem that the empire was acquired in a 'fit of absence of mind'. Saul David creates a vivid portrait of life on the violent fringes of empire, and of the seemingly endless and brutal wars that were fought in the name of trade, civilization and the balance of power. "Splendid â€¦a terrific treasure-chest of anecdotes â€¦a splendidly brisk, cool and judicious narrator". ("Daily Telegraph"). "Incisive and acute â€¦thorough and occasionally revelatory, [David] always finds a telling phrase, an eye-catching detail or a human story". ("Sunday Times"). Saul David is Professor of War Studies at the University of Buckingham and the author of several critically acclaimed history books, including "The Indian Mutiny: 1857" (shortlisted for the Westminster Medal for Military Literature), "Zulu: The Heroism and Tragedy of the Zulu War of 1879" (a Waterstone's Military History Book of the Year) and, most recently, "Victoria's Wars: The Rise of Empire". No comments for "[PDF] Victoria's Wars: The Rise of Empire".